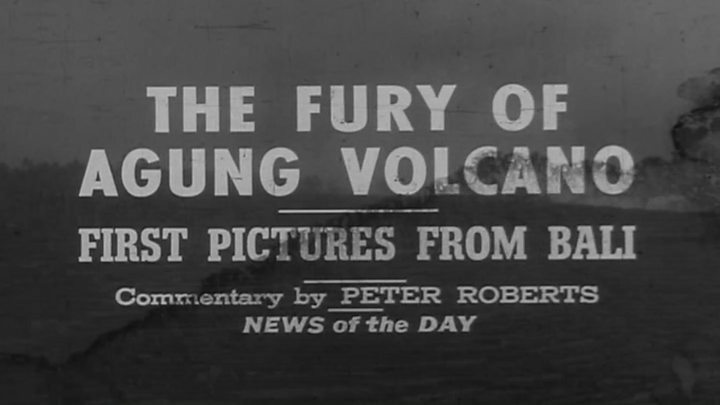 Media captionWe ask an expert: Is a large volcanic eruption inevitable? About 100,000 people near Bali's Mount Agung have been ordered to evacuate as officials fear a major eruption. The island's airport has now closed, leaving thousands stranded in the tourist hotspot. Authorities say dark gas and ash have been billowing up to 3,400m (11,150ft) above the mountain's summit. Mount Agung's volcanic tremors first began in September. What's it like waiting for an eruption? The National Board for Disaster Management raised the alert to level four from 06:00 local time (22:00 GMT Sunday) because of "the possibility and imminent risk of disaster". 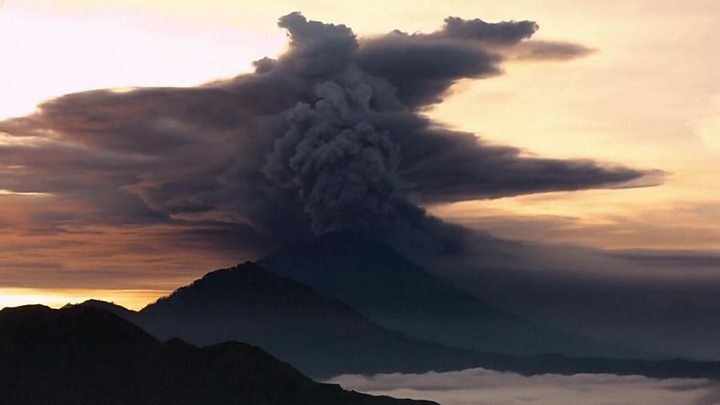 The volcano was seen emitting "continuous ash puffs" occasionally accompanied by "explosive eruptions" and "weak booms" that could be heard 12km (7 miles) away from the summit. "The rays of fire are increasingly observed at night. This indicates the potential for a larger eruption is imminent," it said in a statement (in Indonesian) on its Facebook page. But he added that as eruptions are difficult to predict, it was "very hard to tell" how the situation would develop. "These eruptions can be quite large and extensive and violent, but this could also be a relatively minor eruption over time." 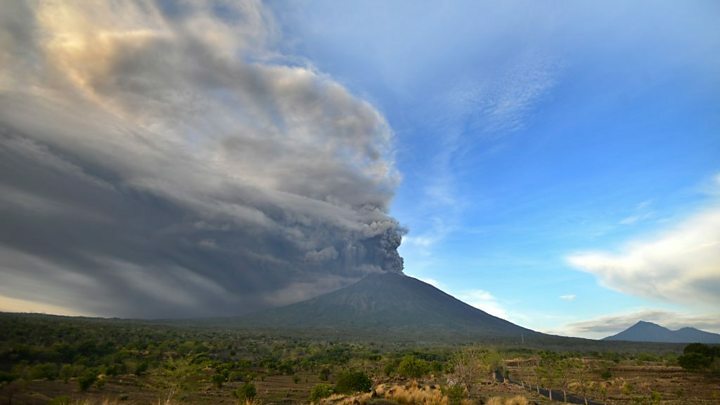 He added that Indonesian authorities had made preparations for an eruption for months, and said they appeared "extremely well prepared", with the situation "well under control". 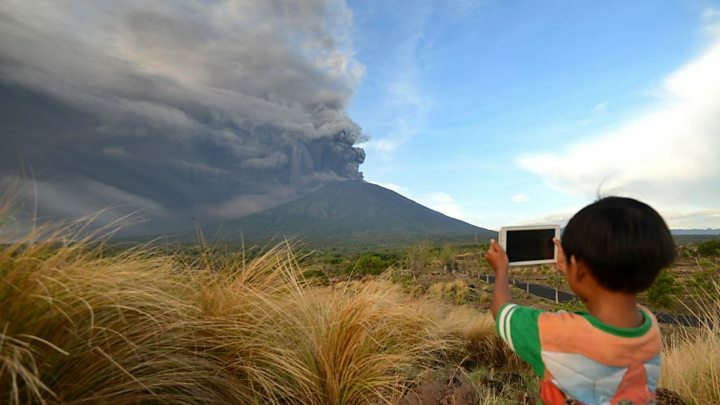 But the ash prompted officials to shut down Bali's Ngurah Rai airport from Monday to Tuesday morning. Airport authorities said 445 flights had been cancelled, affecting 59,000 travellers, while Indonesia's national hotel association said that stranded tourists staying at member hotels could stay one night for free. The Australian government and the UK's Foreign Office have advised travellers to be prepared for cancelled flights, closely monitor local media, and to heed local authorities' warnings. China (statement in Chinese) advised its citizens to be "cautious" if travelling to Bali. A spokesman for Indonesia's disaster agency, Sutopo Purwo Nugroho, said that some people within the exclusion zone did not leave because the area was not touched the last time it erupted - more than 50 years ago. "There's some effort to distribute information and also solar powered TV units which will broadcast information about the evacuation to the camps, should the electricity go out if there's an eruption," she told the BBC. Image caption Officials said the volcano has been emitting "continuous ash puffs"
Lahars, also known as "cold lava", are slurries of rock fragments mixed with water, and have been spotted in fields and rivers near the volcano. Indonesia sits on the Pacific "Ring of Fire" where tectonic plates collide, causing frequent seismic and volcanic activity. It is home to more than 130 active volcanoes. Video Mt Agung: Is large Bali volcano eruption inevitable?